The early hours of this morning saw the 90th Academy Awards take place on a night dominated by women and a love story involving fish. Thankfully there was no mix-up drama like last year as the romantic fantasy The Shape of Water celebrated four Oscars wins which included the all-important Best Picture award ahead of the likes of Dunkirk, Get Out and Three Billboards Outside Ebbing, Missouri. 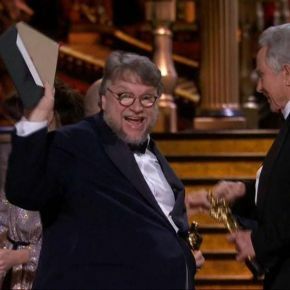 Shape also scooped Best Director for Guillermo del Toro who became the third Mexican filmmaker to win the category in the past four years. The film also picked up Best Production Design and Best Original Score for composer Alexandre Desplat. The next big winner was Christopher Nolan's World War II blockbuster Dunkirk which claimed three gongs for Best Editing, Best Sound Mixing and Best Sound Editing. On a night full of predictable results, British star Gary Oldman was crowned Best Actor for his portrayal of Winston Churchill in Darkest Hour. The historical biopic also took home Best Makeup & Hairstyling. Frances McDormand celebrated her second win in Best Actress for her powerful role as scorned woman Mildred Hayes in the comic-drama Three Billboards Outside Ebbing, Missouri. She delivered a strong speech which involved asking all the Oscar-nominated women in the room to stand up and be applauded as part of the #MeToo campaign. McDormand's co-star Sam Rockwell clinched Best Supporting Actor for playing diverse cop Jason Dixon while Allison Janney was named Best Supporting Actress for her portrayal of Tonya Harding's abusive mother LaVona Golden in the sports biopic I, Tonya. Elsewhere, Jordan Peele deservedly won Best Original Screenplay for his work on the horror hit Get Out whilst veteran James Ivory took home Best Adapted Screenplay for the romantic drama Call Me By Your Name. As well as Darkest Hour, there were also double wins on the night for the sci-fi sequel Blade Runner 2049 and the Pixar animation Coco. The latter clinched Best Animated Film and Best Original Song ("Remember Me") while the former picked up Best Visual Effects and an overdue Best Cinematography award for veteran Roger Deakins who finally won at the fourteenth attempt! The period drama Phantom Thread clinched Best Costume Design while A Fantastic Woman (Chile) and Icarus were triumphant in Best Foreign Language Film and Best Documentary respectively. One of the more unique wins on the night was for Rachel Shenton as the former Hollyoaks actress (Mitzeee Miniver) picked up Best Documentary Short for her work on The Silent Child. The Brit used sign language to thank the Academy for acknowledging the short which sees her play a friendly social worker who helps teach a young, deaf girl how to communicate. Chat show host Jimmy Kimmel returned for a second stint and provided a memorable monologue that made references to the #MeToo campaign and the recent tragedy at Parkland School.